MIT scientists have developed an ingestible sensor equipped with genetically engineered bacteria, that can diagnose bleeding in the stomach or other gastrointestinal problems. This "bacteria on a chip" approach combines sensors made from living cells with ultra-low power electronics that convert the bacterial response into a wireless signal that can be read by a smartphone. "By combining engineered biological sensors together with low-power wireless electronics, we can detect biological signals in the body in near real-time, enabling new diagnostic capabilities for human health applications," said Timothy Lu, an associate professor at Massachusetts Institute of Technology (MIT) in the US. In the study, published in the journal Science, the researchers created sensors that respond to heme, a component of blood, and showed that they work in pigs. They also designed sensors that can respond to a molecule that is a marker of inflammation. In the past decade, synthetic biologists have made great strides in engineering bacteria to respond to stimuli such as environmental pollutants or markers of disease. "Our idea was to pack bacterial cells inside a device. The cells would be trapped and go along for the ride as the device passes through the stomach," Nadeau said. The sensor, which is a cylinder about 1.5 inches long, requires about 13 microwatts of power. The researchers equipped the sensor with a 2.7-volt battery, which they estimate could power the device for about 1.5 months of continuous use. They tested the ingestible sensor in pigs and showed that it could correctly determine whether any blood was present in the stomach. 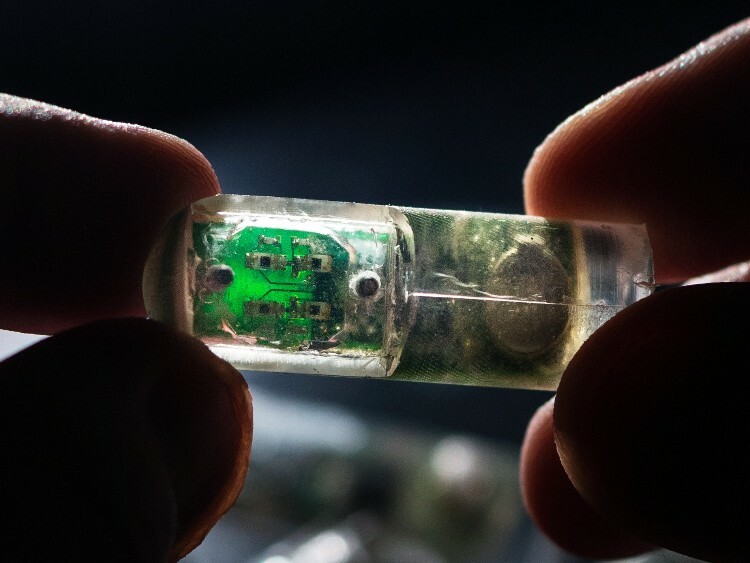 The researchers anticipate that this type of sensor could be either deployed for one-time use or designed to remain in the digestive tract for several days or weeks, sending continuous signals.